1. A kitchen instrument manufactured with a series of thin metal wires, each formed into a loop so both ends of the wires attach to a handle. The loops, which are placed in slightly different directions from each other, form a rounded bulb shape. Whisks are used to blend ingredients together quickly or to incorporate air into ingredients such as egg whites or heavy cream in order to increase the volume of the mixture. There are a variety of different types, shapes and sizes of whisks available depending on the requirements for their use. Some of the most common whisks include: Ball, Round Baloon, Oval Baloon, Coil, Flat End, Flat, French, Piano, Twirl, Whisk with a ball, Dough, Beverage, Twig, and Thermometer whisk. Typically made of stainless steel or hardened plastic, many whisks are available in small or large sizes, with some containing electronic sensors. Electronic sensors that measure statistics such as the temperature of ingredients is of value to many food preparers as they mix foods such as custards, chocolates, or meringues that require whisking the mixtures at specific temperatures. 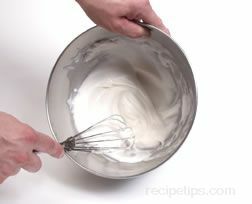 A utensil similar to a whisk known as a whip is often used that is basically a larger version of a whisk. Whisks range in size from 6 to 24 inches in length while a whip ranges in size from 24 to 60 inches in length. 2. The process of using a whisk to blend ingredients together or to incorporate air into ingredients to increase their volume.